Invasive amphibians have considerable negative impacts on recipient ecosystems, however, impact has been assessed for only a few species, limiting risk assessments. In particular, the impact of invasive anurans with carnivorous tadpoles have not been examined thoroughly. The Indian bullfrog (Hoplobatrachus tigerinus), native to the Indian sub-continent, is rapidly invading the Andaman archipelago, Bay of Bengal after its recent introduction. We aimed to evaluate the effect of carnivorous H. tigerinus tadpoles on two species of endemic anuran tadpoles Microhyla chakrapanii and Kaloula ghoshi, in a mesocosm experiment. Rapid predation by larval H. tigerinus resulted in no survival of endemic frog tadpoles. Survival of H. tigerinus was density-dependent. 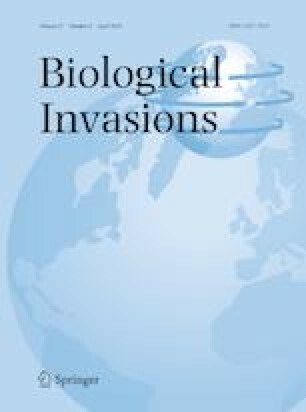 The study is timely in elucidating the impact of invasive larval H. tigerinus on native anurans and substantiates the need to manage invasive populations (or potential incursions) of the species on the Andaman archipelago and elsewhere. The online version of this article ( https://doi.org/10.1007/s10530-019-01985-z) contains supplementary material, which is available to authorized users. This research was supported by the DST-NRF Centre of Excellence for Invasion Biology (CIB). We would like to thank, the Department of Environment and Forests, Andaman and Nicobar Islands for granting permits (#CWLW/WL/134/350); the Rufford Small Grants (#20818-2) for funding and the Department of Botany and Zoology, Stellenbosch University for a bursary to NPM; the Andaman Nicobar Environment Team (ANET) for facilitating field work; Saw Isaac and Anand James Tirkey for collecting part of the data and assistance in the field; the Long term ecological monitoring network (LEMoN), National Centre for Biological Sciences (NCBS) for providing temperature data; Susan Canavan for feedback on the manuscript. NPM would like to acknowledge the support and advice of Dr. Manish Chandi, Adhith Swaminathan and Mahima Jaini during the study.